Christopher Joseph Gedney (born August 9, 1970) is a former American college and professional football player who was a tight end in the National Football League (NFL) for six seasons. He played college football for Syracuse University, and earned All-American honors. He played professionally for the Chicago Bears and Arizona Cardinals of the NFL. He is currently the assistant athletics director for major gifts at Syracuse University. Gedney was born in Liverpool, New York. He graduated from Liverpool High School, where he played high school football for the Liverpool Warriors. While attending Syracuse University, he played for the Syracuse Orange football team from 1989 to 1992. As a senior in 1992, he was recognized as a consensus first-team All-American. 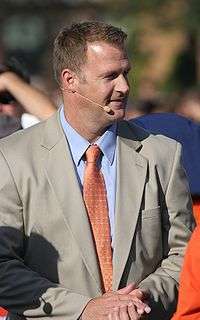 The Chicago Bears selected Gedney in the third round (61st overall pick) in the 1993 NFL Draft, and he played for the Bears from 1993 to 1995. He later played for the Arizona Cardinals from 1997 to 2000. His most productive season came in 1997, where he caught 23 passes for 261 yards and 4 touchdowns. Gedney currently lives in Syracuse, New York. He previously worked as the development liaison for the Syracuse Football Lettermen's Club and is an analyst for the Syracuse Sports Network. On April 29, 2010, Gedney was promoted to senior associate athletic director for major gifts at Syracuse University. ↑ National Football League, Historical Players, Chris Gedney. Retrieved February 14, 2012. ↑ databaseFootball.com, Players, Chris Gedney. Retrieved February 14, 2012. 1 2 Pro-Football-Reference.com, Players, Chris Gedney. Retrieved February 14, 2012.